Focus instead on the fact that Vision Vancouver has created the “greenest city in the world.” Vancouverites are now living under a progressive, green government – or at least you would think if you followed the recent rhetoric of leaders in Vancouver’s liberal NGO environmentalist movement. This week, well-known environmentalist Ben West officially joined the ranks of the many environmentalists mesmerized by Vision Vancouver’s greenwashed optics. For West, “Vision Vancouver is a beacon of hope in the age of climate crisis.” West, and others, have claimed that being a progressive means voting Vision. But supporting Vision Vancouver based on their stance against Kinder Morgan is not progressive, nor is it environmentalist. It reduces the struggle for environmental justice to a narrow, single-issue fight. It removes the openness and diverse reach of environmentalism. It removes the imperative for thinking critically in a time of change. It takes a radical movement and plants it firmly on the side of green capitalism, pro-market solutions, and neoliberal governance. Most important of all, it erases any intersectional, systemic, or long-term analysis of the forces that create the necessity for things like tar sands extraction and bitumen shipment in the first place. 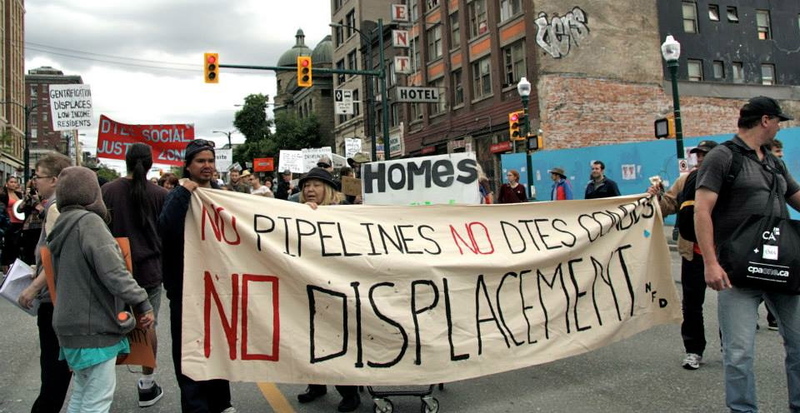 In turn, by rallying behind the process of aggressive urban displacement in Vancouver, it creates a false divide between the interrelated forces of urban and climate dispossession. By supporting Vision Vancouver, environmentalists like Ben West are erasing the voices and struggles of those who are most directly affected by displacement in our city. Why should that matter for environmentalists? It matters because the people organizing against displacement in the DTES are the very people disproportionately affected by the economics of climate change, many of whom – like Peter Deranger – ended up in the DTES because of resource extraction and environmental destruction throughout BC. The story of Peter Deranger is one of many displacement stories in the DTES, and is testament to interlinking systems of dispossession shaping today’s Vancouver. Peter is a traditional Dene elder who grew up in the 1940s within the land of Treaty 8, spanning Northern British Columbia, Alberta and Saskatchewan. As a youth, Peter was displaced by the uranium mines used to supply the atomic bombs that would destroy Nagasaki in 1945. Since then, he’s been displaced from his lands continually – once by the tar sands of Fort McMurray, once in the 1970s by the uranium industry of Northern Saskatchewan, and once again by the wildlife extinction caused by the development of the W.A.C. Bennett hydroelectric dam in Northern British Columbia. “I can’t go back to the paradise of my traditional hunting ground,” he says. “If I want a decent house and a decent living [there], I have to be a corporate slave and work for the people who destroy my own land. So I’ve decided to become a refugee, to come to the Downtown Eastside, to live with my people.” When Peter was interviewed in 2010, he was part of the Olympic Tent Village, a protest tent city in response to Vision Vancouver’s escalated criminalization of poverty and market displacement of low-income people leading up to the winter Olympics. Vancouver, as a colonial settlement formed on unceded lands, is a city of perpetual displacement. Far from simply being the result of unchangeable and “fundamental forces in the real estate market,” as Geoff Meggs has argued, gentrification-powered displacement has been fostered by a series of policy shifts under Vision. This includes the provision of incentives and tax exemptions for gentrifying businesses and developments, as well as significant rezonings for condo developers. Vision’s gentrification agenda culminated this year in the approval of a new Local Area Plan, a 30 year dispersal plan of the DTES community. The plan will: open up the majority of the DTES to unregulated condo development; displace and disperse over 30% of residents needing housing outside of their community and significantly waters down the definition of affordability and social housing to the point that it excludes people on welfare and fixed income as well as other working class renters. The most recent chapter in this saga of displacement unfolded at Oppenheimer Park earlier this fall. 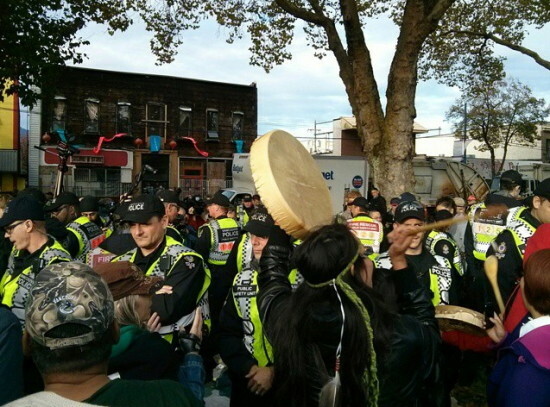 After serving several eviction notices to the mostly-Indigenous homeless residents in Oppenheimer Park, Vision Vancouver took the homeless tent city to court and was swiftly granted an injunction to expel them by force. On direct orders from the Vision Vancouver-dominated city council, five homeless residents who refused to leave their tents were arrested. Humchitt was arrested during the annual Homelessness Week, just as Vision Vancouver’s proclaimed Year of Reconciliation came to an end. He was arrested for being the victim of colonialism, for being homeless, for experiencing intergenerational poverty, and, ultimately, for openly resisting the existing conditions of our world. Humchitt’s resistance and his story is a living testament to the shallow limits of a one-sided politics of recognition. The stories of Peter, Gary, and so many others expose the real contradiction lying at the heart of contemporary elite-based environmentalism in Vancouver. On the one hand, consider the situation of the Gitga’at First Nation as they challenge the Northern Gateway pipeline proposal. The community would be directly affected by the development of pipeline infrastructure, and the presence of new tankers carrying bitumen directly off their shores, in the area near Hartley Bay on the North coast. The community faces displacement, but will also be supported by a growing province-wide movement against Northern Gateway. 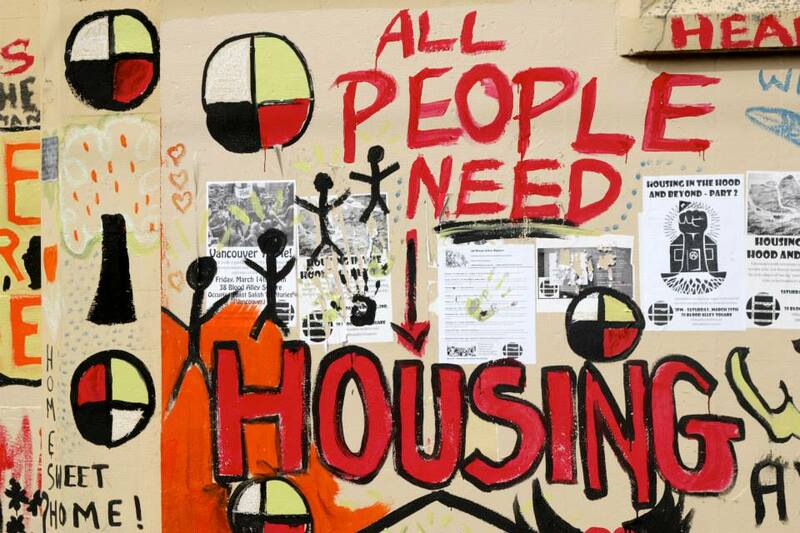 Now consider another Indigenous community facing displacement as a result of for-profit development. We are talking about displacement experienced not in faraway BC, but right here in Vancouver, in the communities of Grandview-Woodlands, Strathcona, and the DTES. The fossil fuel industry may not have a direct hand in their displacement, but the same logic of profit-based development presides. The mass displacement of low-income, racialized and Indigenous people is not a remote phenomenon, but one that defines the very operation of our city. In both cases we have the systematic displacement and dispossession of Indigenous communities. Yet the comparison is quickly dismissed. Why? Because in the case of Vancouver, there is no imaginary colonial wilderness available to defend. In Vancouver the land has already been colonized and “overdeveloped,” which means that displacement is a thing that happened in the past and is now normalized to the point of invisibility. 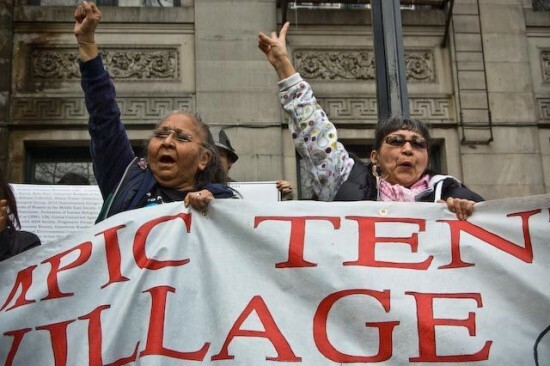 The lesson here is clear: environmental destruction, not Indigenous dispossession or displacement in general, is the defining issue for a new generation of green activists. Slogans like “defend our coast” therefore operate on the basis of a highly skewed politics, reinforcing a colonial sense of ownership of the coast while posing the enemy as external to the white-settler economy as such. “Our” coast and “our” wilderness are posed against an external threat that can be overcome by making harmonious links between everyone from big business to low-level bureaucrats to your local grocer. In this context, the fight to defend displaced populations becomes almost incidental. The implication for mainstream environmentalist ethics here is clear: without a beautiful coast or a pristine wilderness, there would be no fundamental injustice. In recent years environmental activists have increasingly invoked the principle of supporting directly affected communities. In many cases, they have build real lines of solidarity and decolonization with those communities. Alliances and lines of shared struggle have been elaborated and deepened at Unist’ot’en and elsewhere across BC. For large parts of the environmentalist movement, however, the principle applies only in cases where those “directly affected” are located within pristine, bourgeois wilderness. If the struggle to defend the land is defeated, and if Indigenous people are displaced into the cities, the solidarity comes to an abrupt end; the principle of “directly affected” is revoked. Local environmentalist activist and filmmaker Zack Embree, another Vision Vancouver supporter, will soon be launching his new film, Directly Affected. The title of the film plays on the legal wording used by the National Energy Board (NEB) in an attempt to restrict the participation in the environmental review process. During the Kinder Morgan hearings, “directly affected” was invoked as a way to limit the hearing to only those whose economic or physical well-being is directly threatened by the project. This narrow definition of “directly affected” has excluded many who are concerned about the tar sands, climate change, and the broader impact to British Columbia’s environment. Yet in Vancouver, the concept of “directly affected,” which environmentalists ironically wants to expand, excludes low-income people who are displaced and dispossessed by Vision Vancouver. In addition to exposing the cynical double standard at the heart of an environmentalist notion of “directly affected,” it is important to recognize the limits of the concept if it sees oppressed and displaced people as merely victims of capitalism or colonialism. Not only do the collective struggles of low-income people form the lifeblood of a living history in the making, we would add that those struggles are inherently environmentalist. By fighting against a profit-driven economy, and by fighting against a city that places profit before people, low-income residents of the DTES are at the forefront of the fight against the system that causes global warming and environmental destruction. The choice to dismiss or champion different types of dispossession is only possible from a position of privilege. When someone in Ben West’s position makes the decision to endorse Vision Vancouver, it is because he benefits both directly and indirectly from the policies that come with it. Yet, in the same part of the world, on the exact same piece of land, this kind of privilege is not available to the majority of people. Supporting Vision in this context means legitimizing the status quo and the ongoing displacement in our city, but it also means raising the voices of those in our society who can already be heard the loudest. Centring the elite leaves us without any concrete way to engage, increase understanding, and do the basic work of connecting the dots, from Burnaby Mountain to Oppenheimer Park. Only by making those connections can we move beyond a narrow politics of greenwashing and top-down environmentalism. Posted in City Hall, Environment. Bookmark the permalink. when peoples’ basic needs r not met we sometimes turn anger & frustration on each other instead of where it belongs; those who systemically benefit & profit. so frustrating that police r paid to do the dirty work of enforcing injustice. It’s also frustrating that even native peoples r not unified and r fighting each other for scarce resources. I do not want privileged white men pontificating about “green” options. “Fundamental forces of the real estate market”… The real estate market is created and controlled by human beings. Its is not a supernatural force existing outside of humanity! 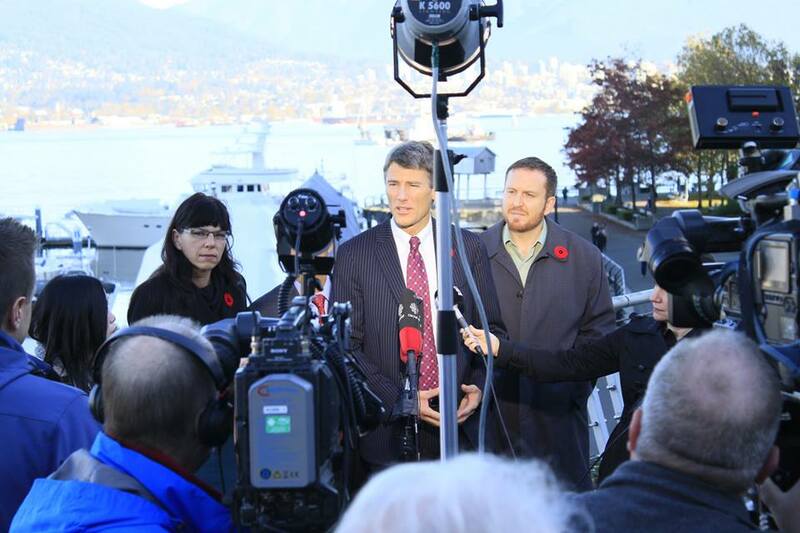 While for the authors give the impression that “Vision” isn’t green enough for them, they aren’t saying anything of the alternative, is their party going to cut back tanker traffic in Burrard Inlet? raise taxes? are they in favor of a permanent tent village in Oppenheimer Park?? …are they really the champion of the ‘marginalized’ or champions of the “other” party? This is one of the most illogical, incoherent and ill-informed article I have read on the subject. Thanks. And somehow electing the NPA is going to be an improvement?? This article is very short-sighted. If we cut global carbon dioxide emissions by 30%, would it stop climate change? This is a serious question. Do you have an answer? If we had PROPORTIONAL REPRESENTATION on multi-winner ballots (like city counselors & school trustees) we could actually vote FOR someone we genuinely preferred & not AGAINST the greater evil. In the case of single-winner races like for MAYOR, we could use another system like approval voting, or score voting or some type of ranked choice voting, or the mayor could be elected from council members, post civic election, by council members. Outlaw or reduce/restrict private funding to candidates and instead provide public funds provided by corporate tax dollars. If the above 3 changes were made, progressives wouldn’t be divided and the fear factor would have much less of an effect.